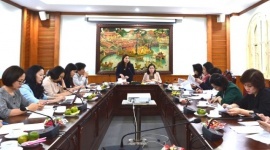 (LDXH) In April 3rd, Minister of Labor - Invalids and Social Affairs Dao Ngoc Dung had a meeting with Mrs. Christina Noble, President of Christina Nolbe Children's Foundation. Attending the meeting were leaders from International Cooperation Department, Children's Bureau, Social Protection Department and the Ministry Office. 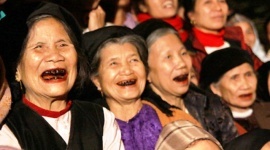 For the past 28 years, the Christina Noble Children's Foundation, a non-governmental organization founded by Christina Noble (in Vietnam since 1991) has deployed over 100 projects in Ho Chi Minh City and some provinces in the South, the Central Highlands with a total amount of non-refundable grants of over $ 20 million. In Ho Chi Minh City, the Christina Noble Children's Foundation has directly sponsored the operation of the Center for Social Protection of Disadvantaged Children since 2005 and the Primary School of Free Elementary Education for street children, immigrant children and disadvantaged children since 1991 with annual funding of $ 500,000. At these facilities, there were about 100,000 children receiving medical care, going to school until they found stable jobs. In Tay Ninh province, the Christina Noble Children's Foundation supports the Center for Visually Impaired Children and more than 1,000 children are raised and trained here. Visually impaired children from 6 to 18 years old are admitted to the eye care and treatment center as well as in Braille and vocational training. Christina Noble not only provides support to children with disabilities, poor children, but also joins many projects to help the poor in the provinces of the Mekong Delta. 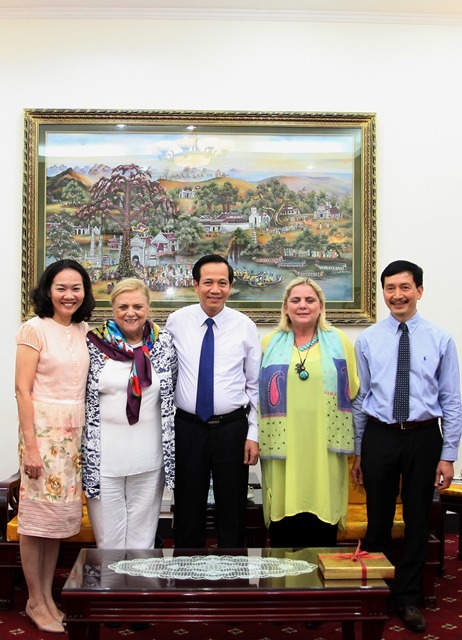 For nearly 30 years, President Christina Noble, with her passion and love for the country, has made practical contribution, especially to the Vietnamese youth. She said that she had been a street kid, who had struggled to live, but "coming from a street kid or a rich kid is not a matter, what important is how to overcome the situation to grow up ". To overcome difficulties, “raise up, raise up and find the way to raise” - this is the great lesson of Christina Noble for all of the children. 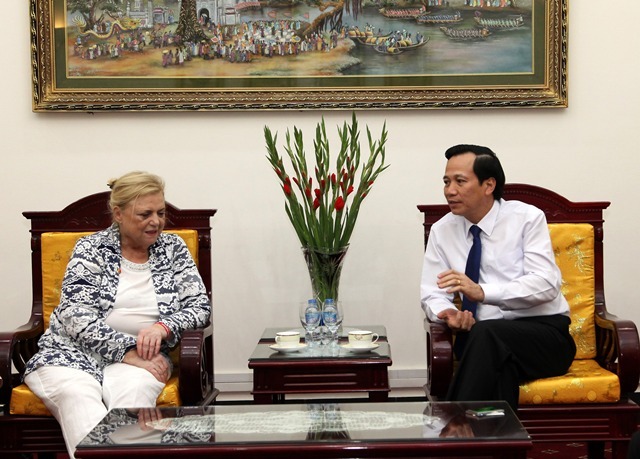 More information about upcoming projects, Mrs. Christina Noble and her foundation are planning to establish an information technology school for Vietnamese youth. Therefore, she would like to ask Minister Dao Ngoc Dung about the feasibility of this idea to coordinate with partners in the future. 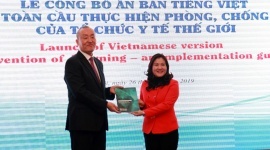 Speaking at the meeting, Minister Dao Ngoc Dung highly appreciated the contributions of Christina Noble to Vietnam in general and children in particular. “I came to the disadvantaged children's social welfare center in Ho Chi Minh City to visit the kids here. I wondered if there were nor projects neither kind heart like Mrs. Noble, where these children would have gone? 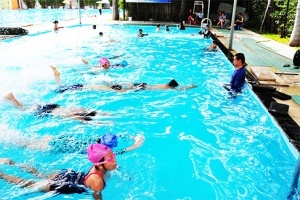 I watched them practice with the dedicated guidance of the doctors and caretakers here. 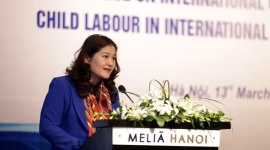 Hopefully, she will be a bridge to call for more investors and donors to come to Vietnam. 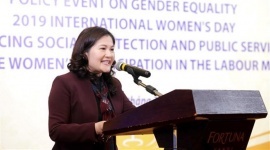 With her contributions, she is well-deserved for the 2010 Friendship Order”, Minister Dao Ngoc Dung said. He also emphasized that children care is the top priority in Vietnam. Vietnamese people can do everything for their children. However, some Vietnamese children are in difficult situation due to the severe consequences of the war. Until now, many children in the third generation are still suffering from toxic chemicals. 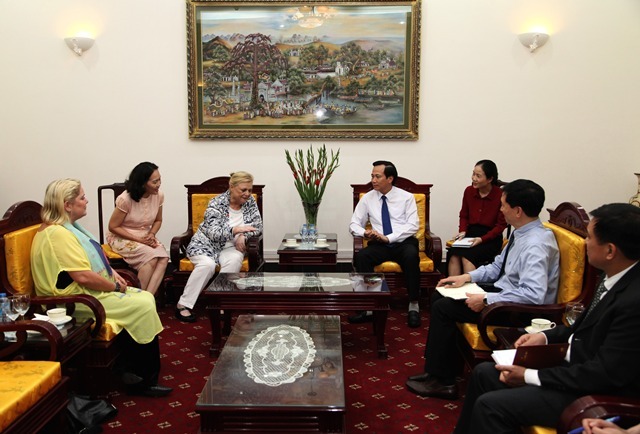 Minister Dao Ngoc Dung hoped that Mrs. Christina Noble and her Foundation, with love for children, will continue to help children and call out donors in Vietnam to give them a hand. Regarding the idea of building vocational schools of information technology, the Minister welcomed and said that this was a very good idea. 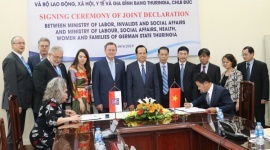 However, the Minister suggested that Vietnam was reorganizing the system of vocational schools, so there are two ways that Christina Noble Children's Foundation can choose: buying new vocational school to teach immediately instead of building a whole new school for independence in management; investing in a school and assigning it to the same school. 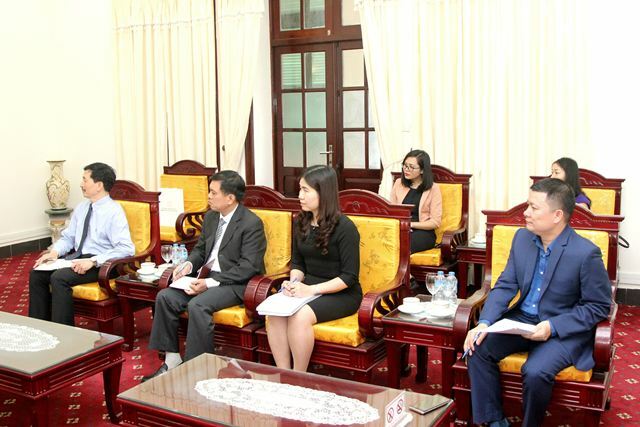 In addition, according to the suggestion of the Minister, the reasonable places to invest in vocational schools are Hanoi, Ho Chi Minh City, Vinh Phuc, Nghe An, Ha Nam.